Hearts manager John McGlynn was not too despondent despite watching his side let a lead slip in injury time against Ross County. meant McGlynn's side missed out a place in the Scottish Premier League's top six. "I'm delighted with the performance that we put on, it was a great performance," he said. "Character was shown by the team. We were away from home, it's not an easy place to come to." 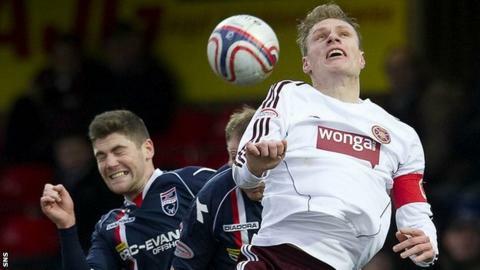 Michael Ngoo and Jamie Walker were on target for Hearts after Rocco Quinn had fired the hosts in front. But Iain Vigurs rescued a point for County just before the final whistle. "We went 2-1 ahead and I thought we were in control of the game," explained McGlynn. "Balls came into the box, we defended most of them very well but that was the one that we didn't quite defend as well we'd have liked to have done and the two points slip away from us. "But, all in all, it's been a really, really good week from last Saturday winning on penalties [in the Scottish Communities League Cup semi-final] against Caley [Thistle], beating Dundee in midweek and coming up here was difficult. "In midweek, Hibs came up here and they went away with nothing so at least we're going away with a point. "There's plenty of games to go for us to do that [enter the top six] and, the way we're playing, I'm confident that we will. "We're playing some great football with a lot of young players in the team. That's great because they're all gaining experience all the time and they'll gain a lot from this game as well. "The players have got a cup final to look forward to on 17 March, so everyone's playing for jerseys for then."